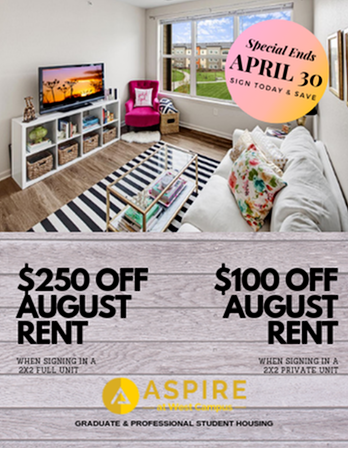 Get in touch with us today to learn more about leasing an apartment. We're located on the University of Iowa campus in Iowa City and offer one- and two-bedroom apartment homes for students and faculty at UI, Kirkwood and other institutions of higher education. Our apartment homes feature spacious floor plans, hardwood inspired floors, modern cabinetry and appliances. Enjoy complimentary cable and internet, the security of limited access entry, as well as the very best in on-site amenities, from a 24-hour fitness center and clubhouse to a dog park (yes we are pet friendly!) and walking/biking trails. Aspire at West Campus is one of the highest rated communities in the area. Contact us today!